Surprise! Magellan drives major biosimilar adoption. Plus, read media coverage of our recent webinar: Preparing for a World Without Rebates. P.S. Join the more than 7,400 people who follow my daily updates and links to neat stuff at @DrugChannels on Twitter. It’s time for Drug Channels Institute’s annual update of the number of U.S. specialty pharmacies. As always, I had outstanding research assistance. (See photo at right.) But even we can’t count the total number of pharmacies dispensing specialty drugs, since any pharmacy can designate itself a specialty pharmacy. We therefore counted every pharmacy location that had achieved accreditation by an independent organization. As of the end of 2018, more than 900 unique pharmacy locations had achieved specialty pharmacy accreditation from one or more of three major independent accreditation organizations. The 2018 figure marks a 25% increase over the 729 locations in 2017 and is more than double the 2015 figure. Pharmacy locations owned by healthcare providers—hospitals, health systems, physician practices, and providers’ group purchasing organizations—now account for more than one-quarter of all accredited specialty pharmacy locations. 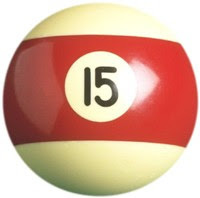 Heading into Year 15, CBI’s Commercial Contract & Chargeback Excellence conference has become a must-attend for pricing and contracting professionals, offering interactive dialogue and best practices to guide you through a rapidly changing market. Our esteemed speaking faculty, made up of companies such as Pacira Pharmaceuticals, Premier, Celgene, McKesson, Chiesi USA, Zydus Pharmaceuticals and more, will collaborate and offer perspectives on chargeback efficiency, class-of-trade, GPO membership management, contract administration, and everything in between. *Cannot be combined with other offers or used towards a current registration. Cannot be combined with special category rates, clinic/hospital rates, non-profit rates other offers. Other restrictions may apply. Today’s guest post comes from Scott Dulitz, Chief Strategy Officer at TrialCard. Scott discusses the evolution of pharmaceutical manufacturer hub programs. As he explains, crucial industry trends are changing how patients and healthcare providers interact with and evaluate support services. To learn more about TrialCard’s patient management solution, view TrialCard's recent video: Emerging Market Trends Shape Hub/Market Access Services, or email Scott at scott.dulitz@trialcard.com. Read on for Scott’s insights. 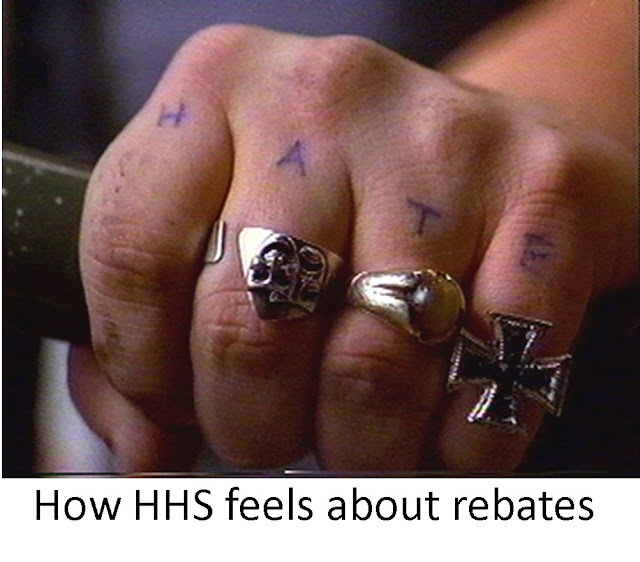 The Department of Health & Human Services (HHS) keeps signaling that it wants to move us toward a world without rebates. Right now, it is evaluating comments on its proposal to remove rebates from federal programs. HHS wants to implement this rule in time for the January 1 start of the 2020 Medicare Part D plan year. 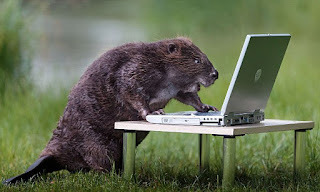 I would like, if I may, to take you on a journey through the 2019 regulatory timeline for both Part D and the proposed rule. As you will see, there is still a viable—but narrow—window for regulatory reform of rebates. Despite our assessment, you should know that in the Medicare program, there are many implementation and logistical challenges in shifting rapidly toward a world without rebates. I outlined some of these issues in last Friday’s webinar: Preparing for a World Without Rebates. Don’t worry if you missed the live event. You can watch a replay and download the complete slide deck. CLICK HERE TO WATCH THE REPLAY. In the meantime, read on for our look at the rest of 2019. I can see you shiver with antici...pation. As genomics and advanced diagnostics expand our understanding of rare diseases, so too does the scope of impact expand. More than 30 million Americans live with a rare disease. While the industry has seen growth and heightened focus around the pursuit of orphan products and rare therapies, we’ve only scratched the surface. CBI and EBD Group, along with support from the Alliance for Regenerative Medicine, Global Genes and MassBio, are pleased to announce the Rare Disease Innovation and Partnering Summit, a platform designed to increase chances of therapeutic success for drug developers, patient groups and investors within the rare disease marketplace. Business brings breakthroughs. Breakthroughs can transform lives. Take a deep dive into the critical and evolving topics impacting you today and hear from industry thought leaders and patient advocates who have designed and led innovative approaches to complex challenges in driving curative progress. Additional perspectives and insight from 50+ leaders at companies such as Aegerion Pharmaceuticals, Alliance for Regenerative Medicine, Asklepios BioPharmaceuticals, Athersys, Bexion Pharmaceuticals, BioMarin, bluebird bio, Blueprint Medicines, Boston Children’s Hospital, Cotinga Pharmaceuticals, Cure CMT4J, Cydan II Inc., EveryLife Foundation for Rare Diseases, Geisinger, Global Genes, Horizon Pharma, Intercept Pharmaceuticals, Jackson Lab, Massachusetts General Hospital, MDA, Pfizer, Rare Access Action Project, Recordati Rare Diseases, Recursion Pharmaceutical, Sobi, Syros Pharmaceuticals, Tufts University School of Medicine, Xontogeny and more. Mark this as a must-attend event in 2019. Don’t miss it! CBI and EBD Group will see you there! Register with promo code DC200 and save an additional $200 on current early bird rate. Join your peers across specialty distribution, patient support services and hub design, and patient services compliance to break down silos and strategize best practices for improving support and access from manufacturer to patient, provider and networks. Our mission is to break down silos between internal colleagues and key stakeholders to help streamline business practices and provide better support and access to patients. Access to Three Tracks: Customize your learning experience through free movement between sessions- All for 1 ticket price! 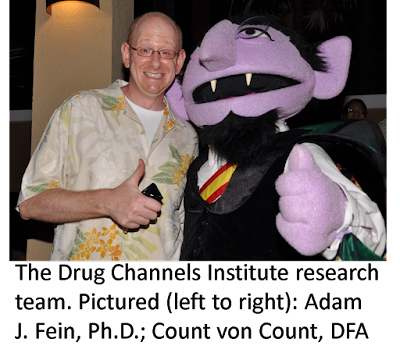 Today’s guest post comes from Bill Nolan, VP/GM of Access and Adherence at RxCrossroads by McKesson. Bill discusses the proliferation of co-pay accumulators and the negative effects they can have on patients, particularly those with high-deductible health plans. He offers solutions that biopharma companies can embrace to mitigate the impact, including the adoption of patient-centric support. To learn more, download McKesson’s white paper: The Impact of Accumulators on Co-pay Programs. The gross-to-net bubble—the ever-growing pile of money that sits between a manufacturer’s list price for a drug and the net price after rebates and other reductions—reached another high last year. Drug Channels Institute developed the term gross-to-net bubble to describe the speed and size of growth in the total value of manufacturers’ gross-to-net reductions. We estimate that in 2018, the total value of gross-to-net reductions for brand-name drugs was $166 billion. As you will see below, that figure doubled over the preceding six years. 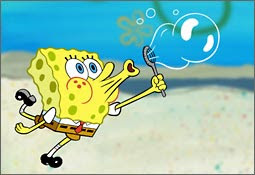 Below, I also highlight the various elements that fill the bubble. About two-thirds of total gross-to-net reductions come from rebates paid to third-party payers. 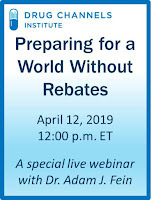 Drug Channels Institute will host an exclusive new webinar, Preparing for a World Without Rebates, on April 12, 2019, from 12 p.m. to 1:00 p.m. ET. CLICK HERE TO LEARN MORE AND SIGN UP. On April 12 at 12:00 p.m. ET, Drug Channels Institute (DCI) will host an exclusive new webinar: Preparing for a World Without Rebates. Join Dr. Adam J. Fein, CEO of DCI and author of Drug Channels, for this hour long, live event as he helps you understand and get ready for what would be a momentous change to our industry. opportunity for only $250 per phone line. NOTE: A replay of this event is available. Click here for more information. An unlimited number of people may listen on a single phone line. Invite your whole team for an hour of intensive learning and strategic insight. The presentation is sure to spark important internal discussion about the implications for your business. Dr. Fein’s slides with marketplace data and analysis. You’ll also receive a downloadable PDF with all of the slides from the webinar. A serious effort exists to remove or decrease the role of rebates in the drug channel. We will help you and your team master one of the hottest topics in our industry. PLUS: Dr. Fein will take your questions. The webinar will take place on April 12, 2019, from 12:00 p.m. to 1:00 p.m. ET. Sign up now for only $250 per phone line. At least 48 hours before the event, you will receive an email with a toll-free dial-in number and a unique PIN for your location. You will also receive an email on the morning of the event. Invite your entire field team to listen from multiple sites around the country. Contact Paula Fein (paula@drugchannelsinstitute.com) to get special pricing for 10 or more locations. If you purchase access for multiple sites, we will contact you for the names and email addresses of a contact person at each location. Pembroke Consulting clients receive free access to the webinar. Contact Tamra Feldman (admin@drugchannels.net) for details. P.S. No, this is not an April Fool's joke. The webinar will really happen on April 12. No foolin'!